A new ready to go E-Shop is a clean Joomla 3 VirtueMart e-shop. It is fully responsive, wghich means that it adapts to the screen resolution of the devices - smartphones, tablets and desktops. 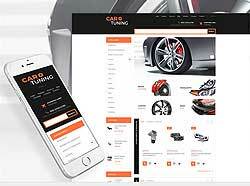 This e-shop may be used for any type of eCommerce websites related to autos or motorcycles..
At the top of the first page we have placed an image Slider. It will help you showcase several of your best products or promotions. On the main page you also will find the section of the VirtueMart - the most popular eCommerce Joomla extension for creating an online store. We have placed a shopping basket at the top of the main page, so your customers will immediately see how many goods they have already chosen. Bellow the shopping basket we have placed the creative search field for a quick search the new products. You can see a live demo of this e-commence application HERE.